Most people think of New Jersey as a suburban-industrial corridor that runs between New York and Philadelphia. Yet in the low center of the state is a near wilderness, larger than most national parks, which has been known since the seventeenth century as the Pine Barrens. The term refers to the predominant trees in the vast forests that cover the area and to the quality of the soils below, which are too sandy and acid to be good for farming. On all sides, however, developments of one kind or another have gradually moved in, so that now the central and integral forest is reduced to about a thousand square miles. Although New Jersey has the heaviest population density of any state, huge segments of the Pine Barrens remain uninhabited. The few people who dwell in the region, the “Pineys,” are little known and often misunderstood. Here McPhee uses his uncanny skills as a journalist to explore the history of the region and describe the people—and their distinctive folklore—who call it home. Ha! Well, even though it wasn’t about New Jersey mobsters, I still enjoyed the book 😉 and if it weren’t for this Sopranos episode, I probably would have been “most people” described at the top of the blurb up there. So I knew there was this wooded area, but I learned a lot about it from The Pine Barrens, more than you think in just 157 pages. 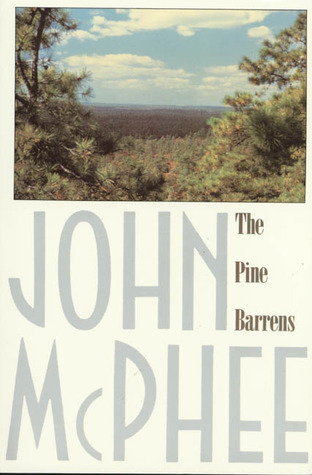 The Pine Barrens was first published in the late 1960s, so the information is from the late eighteenth century up to then. It would be interesting to read some updates (I had time for only a little internet searching after reading this book), and while the drawings were nice and added to the “vibe” of the book, the inclusion of a map or something more detailed would have been great, too. Of course, now, you can find all that on the internet. Once in a while the narrative tends to ramble a bit and I found myself slightly bored in a few spots. Anyway, I loved learning about the people of the Pine Barrens and their folklore the best. The Jersey Devil and witches? Awesome. There are stories of families, nature, agriculture, food, forest fires, visitors to the Pines welcome and unwelcome, and more (and there may have been a mention of mobsters in the woods 🙂 ). I loved the sense of pride the natives to the area had, and their intimate relationship with the woods. It took me about two (short) chapters to really get into the book, but I’m so glad I stuck with it. We had a great discussion in the book group, and I enjoyed learning more about McPhee and his writing process—he’s a careful craftsman with his writing and it shows. The Pine Barrens is a quietly thoughtful portrait of a special place in the United States, one worth protecting and preserving. Read from November 16 to 23, 2013. This entry was posted in books and tagged folklore, history, nature, non-fiction, society, stranger than fiction, travel by kristin @ my little heart melodies. Bookmark the permalink.